Every year I have much to be thankful for, but right now as I work to finish my latest screed (hence the lack of posts last week), I have some specific things to be grateful for. A book is an endeavor that draws upon many people. You always have several editors: an acquisition editor, then a copy editor, and ultimately a marketing editor. I’m still at the stage where I’m working with my acquisition editor, but he’s provided much guidance and support. He’s also arranged a relationship with a major society for support, and they’ve been very forthcoming with assistance. If you do it right, and I try, you also are dependent on some colleagues who’ve stepped up to provide case studies or interviews for you. I’ve been fortunate that I have several individuals in both categories. You also find yourself very grateful for other colleagues who’ve provided guidance in various ways about the book writing process, strategic input, and offers for support upon release. A book can’t cover everything, and it’s a benefit to know that colleagues have written other books that you can point to. Having those other thoughts to incorporate the gist of, and point to for further depth, helps keep the effort focused. And, of course, you almost always end up having the deeper support of friends and colleagues who step up to take up some slack, or answer quick questions, or even just cheer you on. And you’re lucky they are there to assist, but also ask the tough questions and keep you from going off the rails. Finally, you typically have family who support you in a variety of ways, physically, mentally, and emotionally. And I’m fortunate to acknowledge that I do. So there’s much to be appreciative for this endeavor, and of course in general. So I have thanks for all of the above, and to you for taking the time to read this. Wishing you the best to you for this time of year, and hoping you get to have quality time with friends and family, and have much to be grateful for as well. Technology has revolutionised every aspect of our lives and how we learn is no exception. The trouble is; the range of elearning technologies and the options available can seem bewildering. 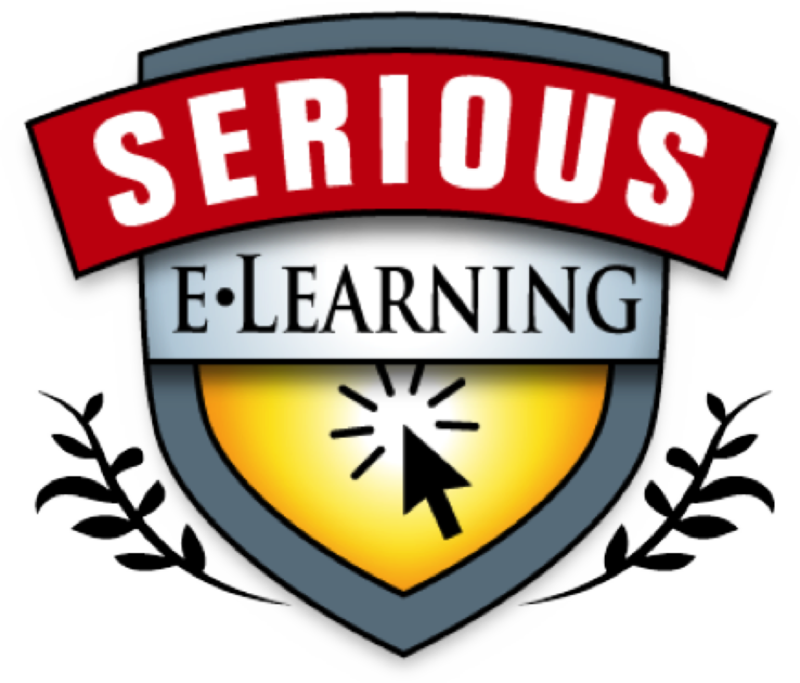 Even those who are highly experienced in one aspect of elearning will lack knowledge in some other areas. Wouldn’t it be great if you could access the hard-won knowledge, practical guidance and helpful tips of world-leading experts in these fields? Edited by Rob Hubbard and featuring chapters written by global elearning experts: Clive Shepherd, Laura Overton, Jane Bozarth, Lars Hyland, Rob Hubbard, Julie Wedgwood, Jane Hart, Colin Steed, Clark Quinn, Ben Betts and Charles Jennings – this book is a practical guide to all the key topics in elearning, including: getting the business on board, building it yourself, learning management, blended, social, informal, mobile and game-based learning, facilitating online learning, making the most of memory and more. If you’d like to purchase the book, VBF11 is the promotion code to get 15% discount when you buy the book at www.wiley.com, or you can get it through Amazon as a book or on Kindle. I look forward to getting my copy in the mail! For one, the question was how to start. I suggested making small changes in what was being done now: push back a bit on the immediate request for a course, and start really diving into the real performance problem. Then, of course, designing a solution for the real problem. I also suggested starting to chunk content into finer granularity, and focusing on the ‘least‘ that can be done. I didn’t add, but should’ve, that bootstrapping some community would be good, and I’d also suggest that you have to be ‘in it to win it’ (as the lottery would have it). You have to keep experimenting yourself. I added that you should simultaneously start some strategic planning. That is, be looking at the larger picture of what can be done and where an organization should be, and then figure out what steps to take towards that in what order. When I run my elearning strategy workshops or for clients, some folks might need to start working on performance support, others might best benefit from initial efforts in social, and some might better start on improving learning design. And that’s all good, it’s what is right for them and where they’re at. But you won’t get there if you don’t start planning. One of the attendees started asking further, and was already doing some prototyping, which triggered another response from me. Start prototyping different approaches. Web (including mobile web) is a really good way to follow on from choosing the early adopter to work with, finding an area where a small intervention can have a big impact, and get some initial measurable improvements to leverage. Iterate quickly. As a final suggestion, I added that there likely is a need to ‘manage up’, that is educate your bosses and up about the need for the change. 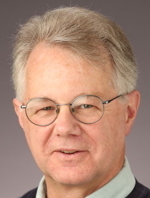 It’s really Org Change 101: you need to create a vision, get buy-in, spread the message (the benefits of change, as as Peter de Jager suggests, make it a choice), support and reward the change, get some early success, and leverage that going forward. This seems like some sensible top-level approaches, but I welcome additions, revisions, improvements. I was talking to the ADL Mobile folks about mobile design processes, and as usual I was going on about how mobile is not the sweet spot for courses (augmenting yes, full delivery no). When tablets are acting more like a laptop, sure, but otherwise. I had suggested that the real mobile opportunities are using sensors to do contextual things, and and I also opined that we really don’t have an instructional design model that adequately addresses taking context into account. I started riffing on what that might involve, and then continued it on a recent trip to speak in Minneapolis. Naturally, I started diagramming. I am thinking specifically of augmenting formal learning here, not performance support. 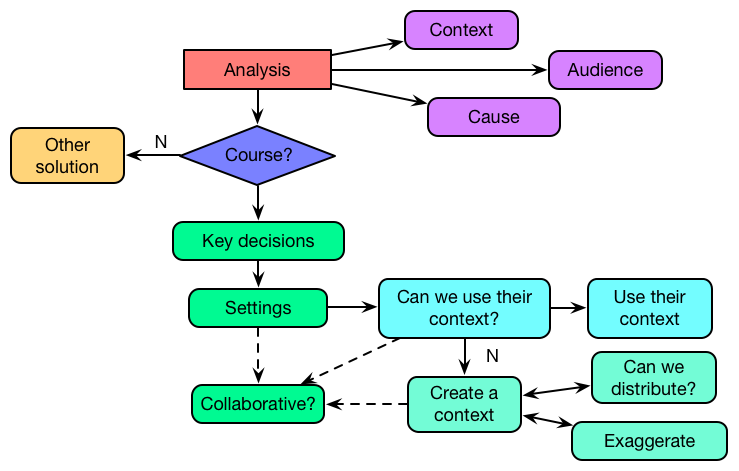 In this diagram, when it’s not a course you head off to consider contextual performance support, if indeed the context of performance is away from a computer. When, however, it is a course, and you start embedding the key decisions into a setting, the first thing you might want to do is use their existing context (or contexts, it occurs to me now). Then we can wrap learning around where (or when) they are, turning that life event into a learning experience. Assuming, of course, we can detect and deliver things based upon context, but that’s increasingly doable. As an aside, I wondered when/how collaboration would fit in here, and I don’t yet have an answer: before setting, after, or in parallel? Regardless, that’s definitely another consideration, which may be driven by a variety of factors such as whether there are benefits to role-play or collaboration in this particular instance. 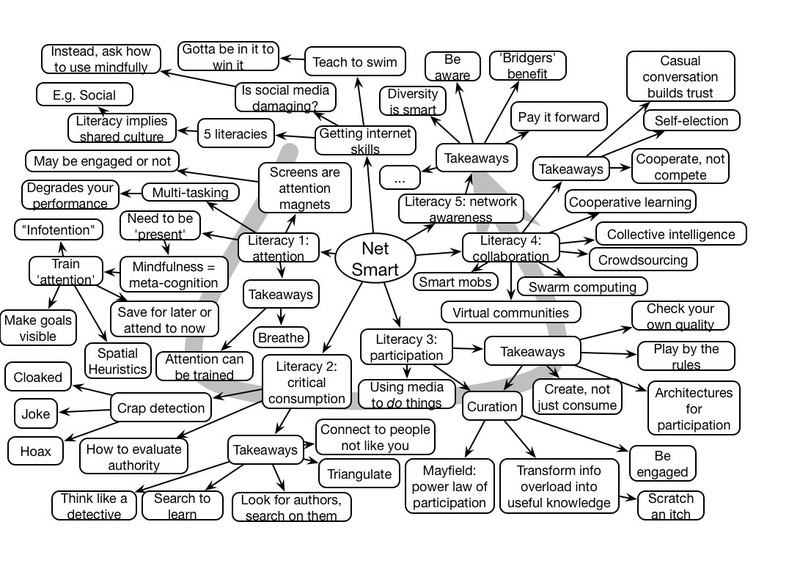 This is still very preliminary (thinking and learning out loud), but it has some initial resonance to me. For you too, or where am I going off track? In thinking about how L&D needs to shift to accommodate this new day and age, I started thinking from the perspective of why the term Learning & Development (let alone Training & Development) bothered me, and it’s because I believe we need to shift from thinking about learning to think about performance. My first take was that training and development wasn’t enough. Even learning & development isn’t enough; we need to focus on developing individual and team skills and contributions, but where does performance support fit? As another way to think about it, I started with the combination of Optimal Execution and Continual Innovation, and worked backwards. I was trying to find the elements that contribute to each. What are the components we can use technology to improve individual and group contribution to optimal execution? What can we do to similarly improve continual innovation? For execution, we have training, performance support, performance coaching, assistance from others by cooperating, and self-designed or acquired support as part of personal knowledge management (PKM). For innovation, we want self-development by personal knowledge management, collaboration amongst individual, mentoring to develop individuals and ideas, and education to introduce new skills ideas. Elements of those components fall variously under formal, performance focus, or eCommunity. Underpinning this is a culture where cooperation and collaboration can flourish. Note that there are opportunities for support of those component skills, like developing coaching and mentoring skills, that cut across the areas, but this seemed to be a manageable way to look at it. Going further, when I look at what contributes to execution, it ends up being about performance. When the focus is supporting innovation, we can call it development. What we can, and should, be focusing on is both supporting performance in the moment and developing individual and team capability over time. The skills are performance consulting, and facilitation of development and innovation. Thus, the field, to me, is really about performance and development. This is a first cut, and I’m willing to consider improvements. There are layers below this that are being glossed over to focus on the top level, but I really do think that we need a broader focus, and this seems to capture the way my thinking is going. So, what am I missing? I have only recently upgraded to a phone with any meaningful voice capabilities, an iPhone with Siri in my particular case. And I really hadn’t put it to the test, but that changed this past weekend. I had a long solo drive home and time to think. When I headed out, I had some logistical details, so I asked Siri to call home. This I’d done before. Then, finding out m’lady was out and about, I decided to see if I could text by voice as well (which my brother assures me is how he always does it on his Android device). Sure enough, I could send text messages. I’d deliberately set my mind around focusing on my current project and taking some ideas further. And, indeed, I had a revelation. What could I do? Could I take a note? Why, yes, I can. However, Siri stopped too early, so I tried speaking quicker. Which has it’s own problems, but I achieved a useful reminder. And, then I decided I’d write a blog post about my thoughts, and I wanted a reminder (there’ve been times in the past when I had a good topic, but by the time I got back I couldn’t remember what it was). By experimentation, I found that I could indeed also make a Reminder (aka ‘ToDo’). So I made one for that post (coming soon), and one to write this (see, it works!). I only wish Siri could diagram for me too, or at least drive so I can do the diagramming ;). For another, taking time for reflection is powerful, particularly if you seed yourself a goal. I turned off the radio to make sure I wasn’t distracted, and the miles flew by while I worked on my topic. Coming in my next post, my revelation. 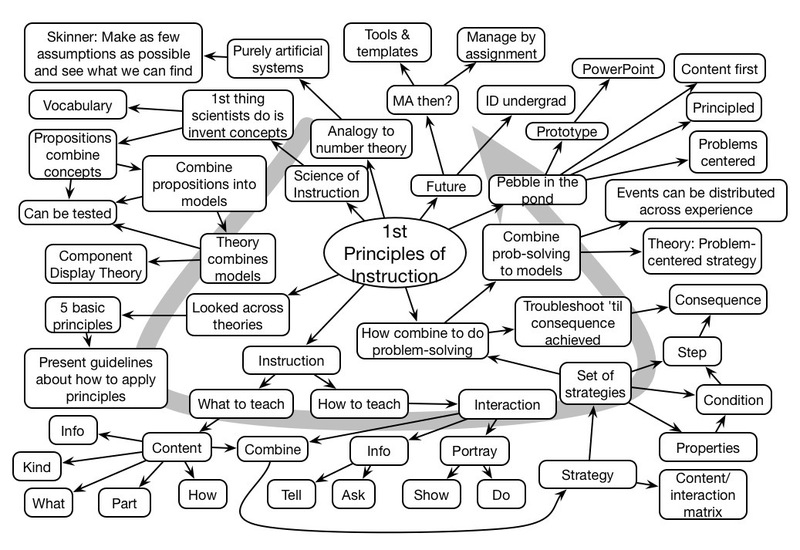 David Merrill talked about his first principles of instruction, leading the way through the development of his thinking. I admit that his steps from strategy to problem-solving were a little elusive, but I was pleased to see that he has come around to problem-centered learning, and design by prototyping and refinement. His take home in the Q&A was to have more examples and put problems first. Always a pleasure to hear him. Howard Rheingold gave a fast-paced and inspiring talk on social network skills. With great examples and deep insight, he brought home powerful lessons on the power of people. His takeaways provided valuable lessons for individuals, schools, organizations, and society.